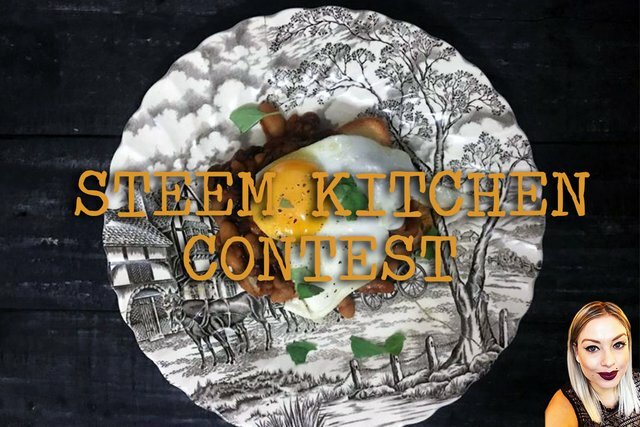 My favourite foodie server on Steemit @steemkitchen is having a weekly contest where you can win 10 STEEM! Cowabunga dudes! This week's theme is CHEAP AND CHEERFUL, and they have asked us to make something amazing with ingredients that are in our store cupboards. 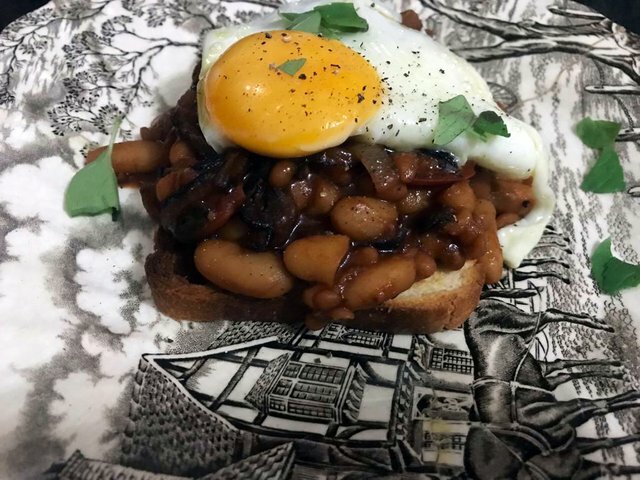 I chose to make my favourite, Posh Beans on Toast. The name stems back to when @morkrock and I had a restaurant, back in 2013, and our British friend, Dave, named my Beans on Toast, POSH. I love this dish, and make some variation of it most weeks. Some weeks I just have a bowl of beans with a fried egg, and others I'll go the full monty with toast too. 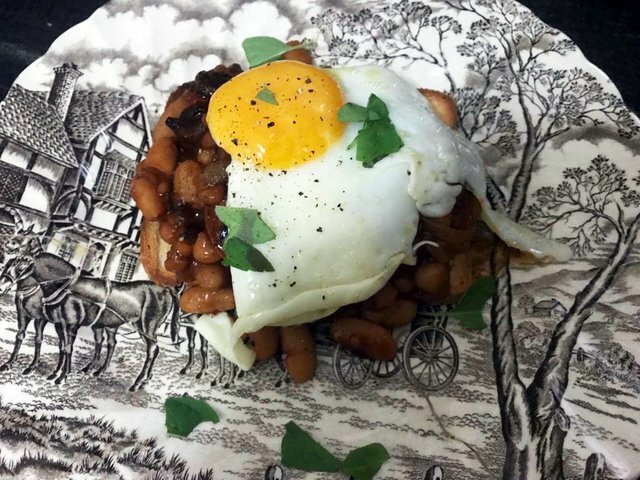 So without further ado, here is my recipe for Posh Beans on Toast, made completely with items out of my kitchen cupboard. Not one item was bought specifically for this dish! Heat up a little olive oil in a pan, and fry the onions until translucent. 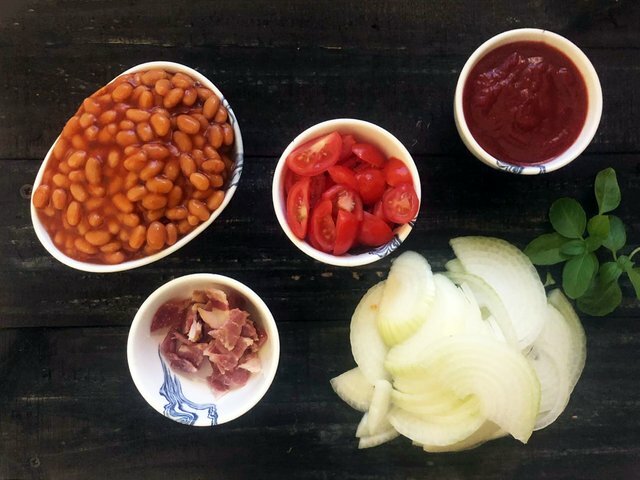 Once cooked thoroughly, add the baked beans in their tomato sauce, and the drained cannelini beans. Add the basil, salt and pepper to taste, the tomato paste and the stock, along with half a cup of water. Turn the heat down to a simmer, and cook until the liquid has thickened. Once it is almost ready, add the bacon and the cherry tomatoes. Cook for a further minute, and take off the heat. Now, fry each person an egg, and toast their bread. It's important to toast the bread, as it will turn to mush if you don't. 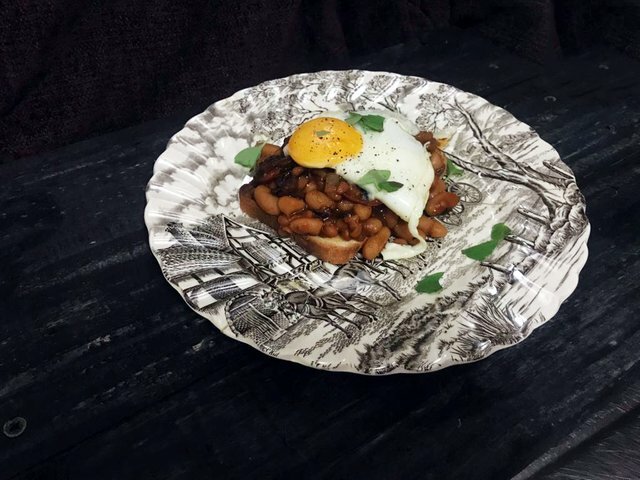 Plate with the toast as the bottom layer, then the beans, and top with a delicious fried egg. Garnish with a few torn basil leaves, and VOILA. 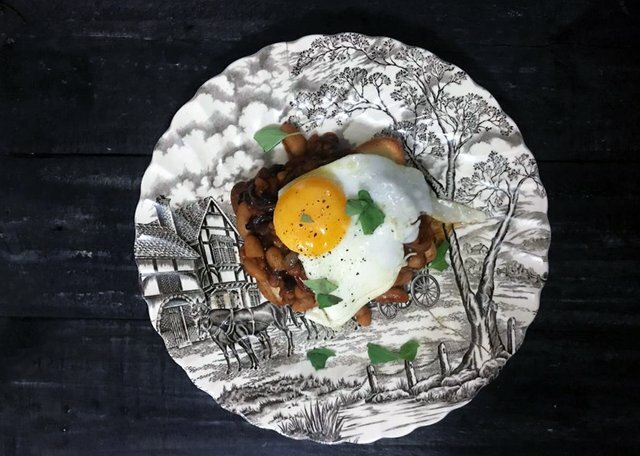 This dish costs approximately R60 ($5) in total to make, but if you have a well stocked pantry cupboard, you could easily adjust it to be made from some surplus ingredients you have. This has been my entry into @steemkitchen's weekly contest. If you'd like to read more, click here. I urge you to join the Steem Kitchen discord server, they have some amazing foodie contests every now and then! Oh this is something I could definitely make! Would be fabulous for a brunch on a cool autumn Sunday morning. Only ingredient I'm short on in the pantry and kitchen is the cherry tomatoes; but my favorite farmer's roadside stand is still open and just a quick jaunt up the road. ahhh thanks battlebutt! i love the plate too, i've broken it and fixed it twice! Oh YUMMY! I adore beans on toast, though nowadays I have it sans toast, but it's still yummy. And I'm now happily in the land that originated beans on toast, good ole' England so this is even more exciting for me. The addition of the egg is genius as I love egg on anything! And the final wonderful moment...That transferware plate. I adore transferware.